Hi Bloggers, Welcome to Bloggerhangout !!! For Newbie or Noob: FeedCount is another cool way to promote your feed. It will display your feed's current circulation, as calculated by FeedBurner. In past, I had observed that people are interested in blogs which contains more number of readers in FeedCount. Step 1: Sign into your FeedBurner account. If you don't have an account in it, you can register here. Step 2: Click on the "My Feeds" link at the top right corner of the page and then select your blog name. Step 3: Click on the Publicize tab. Select Use as a widget in Blogger. 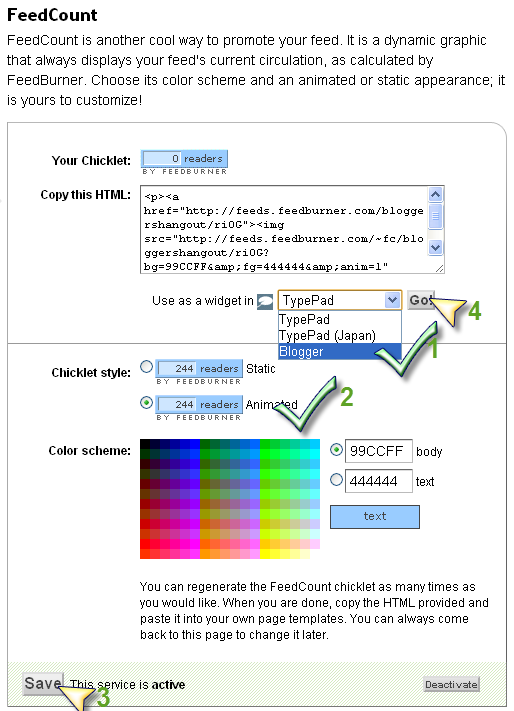 Click Save button in FeedCount page to activate the service and color scheme as you wish. and click "ADD WIDGET" button. Step 7: And then click save button in Edit Layout. That's it! You successfully completed adding FeedCount to Blog. 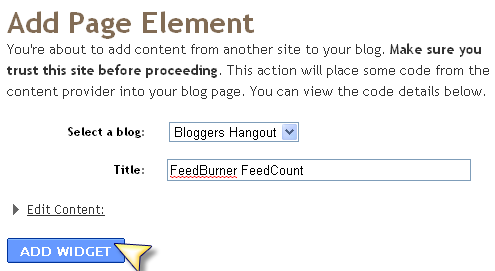 If you have any doubts in this post "How to Add FeedCount to Blog", please don't hesitate to Comment.